When it comes to archiving you can use the best hardware, highest quality discs, and the greatest software to get your files burned to your personal archive, but where do you store the discs? Maybe you haven’t run across the DIGISTOR™ 80 disc Storage Cabinet. We have been selling (and using ourselves) this storage case for CD’s, DVD’s, Blu-ray discs and even video games for a while now, and it’s perfect for storing your archived BD-R discs! Every time I show someone this storage cabinet they are always impressed that it easily slides open with a battery-free gliding door, and clicks closed with ease. So, the best way to show the product is this quick video. A feature that is also hard to believe how great it is until you experience it is that these units are stackable. They really interlock when you stack them, and will not fall. I used to have two units stacked on top of my subwoofer, and they never moved! When you’re looking to store your archived data, or even just have quick access to your video game discs, this DIGISTOR™ 80 disc storage cabinet is perfect. If you have any questions about it, just leave a comment below! Archiving your digital assets, especially your can’t-live-without documents and photos, is more important now than ever before. Everything we create, save, and share is on our PC or Mac computers. Fortunately, archiving your entire digital life has become more affordable, and amazingly easy with the release of DIGISTOR’s consumer friendly archiving application called REWIND™. DIGISTOR has seen an increased interest in Blu-ray burners and 50GB BD-R media for archiving use, especially in the Mac community as of late. REWIND™ allows your PC and Mac to turn into a powerful permanent archiving machine. DIGISTOR offers a great slim sized external Blu-ray burners for ease of installation, and portability. One Blu-ray burner can be transferred to all the PC’s and Mac’s in your house! We offer 25GB BD-R/RE, 50GB BD-R/RE, and even 100GB BDXL Blu-ray recordable discs. The DIGISTOR Media is high quality HTL type and incredibly affordable. This is where REWIND™ comes in. We’ll be going over the 3 easy steps to creating a perfect personal archive with REWIND™. You don’t have to use DIGISTOR brand Blu-ray burners and Blu-ray media with REWIND though. If you already own a Blu-ray burner, we will be offering REWIND™ as retail software next month. Yes, we said this would be amazingly easy. A full step dedicated to giving your archive a name. REWIND™ can continue to span discs once the Blu-ray is full. You don’t have to limit your archives to just one specific group of photos like “Our Vacation to Hawaii”. 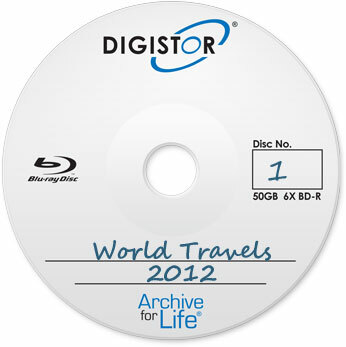 You can broaden out your archive and save every byte of your photo albums and start an archive called “World Travels 2012”. Some other examples might be “Entire Music Archive” or “Scanned Documents”. REWIND™ has a great file browser for maneuvering your computer and selecting files to archive. The thumbnail view makes it a breeze to view a large icon or thumbnail views of photos. Easily select a file or folder by choosing the checkbox next to it. You can click ‘n drag to select multiple items at once. For large archives, the select all button works really well. Visit the Pictures shortcut on the left, hit “Select All” and bam, you have all your photos selected for archiving. An additional easy to use feature for selecting files and folders is the drag ‘n drop ability to add files and folders to the archive by choosing them from your regular PC or Mac file system and just dragging the files or folders on top of the REWIND™ Select Files window. 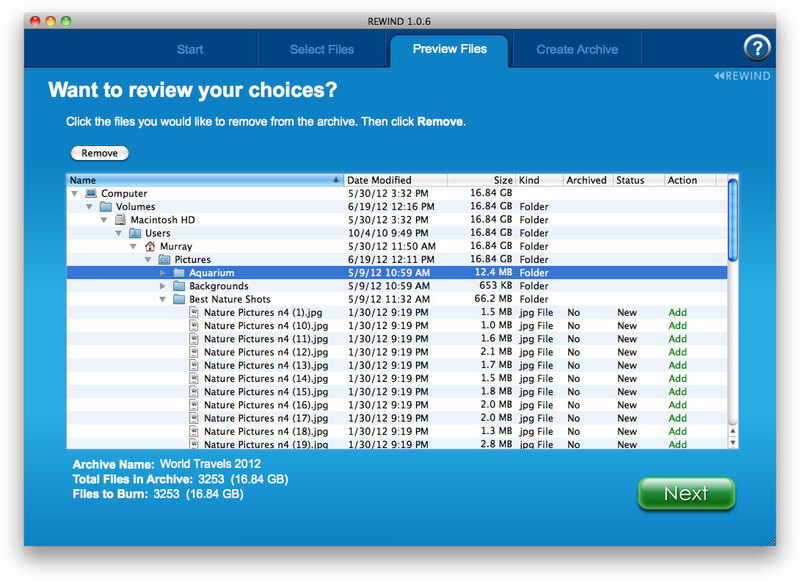 The files and folders are now automatically selected in REWIND™. Not really a full step in itself, REWIND™ gives you a list view to review your choices and make any final decisions to remove a file or folder. Yes, step 3 is nearly as simple as Step 1! All the settings are already chosen for you, but we’ll review them here anyway. If you’re using an External DIGISTOR Blu-ray burner, make sure it is plugged in, switched ON, and loaded with your favorite brand of BD-R or BD-RE media. 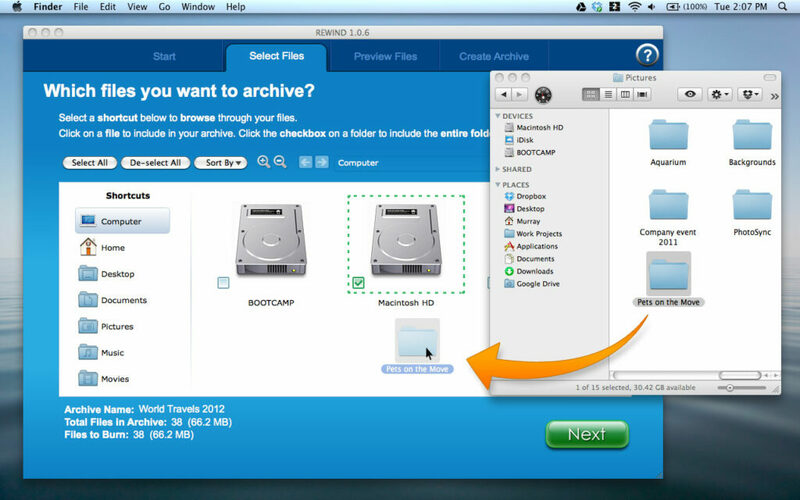 The Choose Archive Burner dropdown only shows Blu-ray drives which means your burner should automatically be selected. Select your archive speed from the second drop down. REWIND™ also does this for you by automatically selecting the maximum speed the drive and media can burn together. REWIND™ gives your disc a name, but you have the chance to change that on this step as well. The disc name will have an appended disc number after it has been burned. REWIND™ can verify the data while writing to the disc. This is checked ON by default, so you can have peace of mind that your data was verified as it was written to the disc. This does lengthen the overall burn time, but for important long term archives it’s worth the wait. That’s it! You’ve archived your favorite documents, pictures, music, or all of the above! Remember to write the name of your archive and what disc number it is so you can have a pleasant restore process if needed in the future. You may have noticed some BD-R discs state a clear warning that they are LTH (Low to High type). Why do they need this warning? What are your options when buying a recordable Blu-ray disc, and does the quality of these discs matter? There are two types of Blu-ray disc material used to create 25GB BD-R discs. Phase-change HTL media uses inorganic alloy or composite material for creating high quality Blu-ray discs. An inorganic recording layer means high resistance to the effects of UV light and aging, as well as high compatibility with multiple Blu-ray burners and Blu-ray players. All together this allows HTL BD-R discs to have a tremendously long shelf life with high compatibility across hardware, key factors in a medium that holds your data. HTL refers to the discs reflectivity during recording, changing the material from high reflectivity to low reflectivity. Using the phase-change inorganic material also allows manufacturers to take the next step and create multiple layers on a single sided BD-R disc and even create rewritable BD-RE discs. 50GB BD-R and 100GB BDXL discs are possible using advanced methods to create multiple layers on an HTL disc. 50GB discs are double-layered at 25GB per layer, while 100GB BDXL discs are triple-layered and hold 33.3GB per layer. Though the multiple layers on both 50GB and 100GB discs are seamless when using the disc, 100GB BDXL media does require a BDXL capable drive to read and write to BDXL discs. The process for creating phase-change discs is unique, and rather costly to get started on the manufacturers part. HTL media requires new equipment that uses a sputtering process of coating the disc, which differs from traditional CD, and DVD manufacturing methods. However, the result is a high quality high density disc that you can trust to hold your data for decades. Sputtering is a process used to coat the surface of a phase change HTL BD-R or BD-RE disc with inorganic material. This technique introduces argon gas in a vacuum chamber, and by applying an electric field, ionizes and becomes plasma. By kinetic energy transfer it ejects atoms of the inorganic material which move toward the Blu-ray disc to form a thin film. LTH media is an organic dye-pigment disc that found its way into the market to offer a lower cost alternative disc in Blu-ray’s infant years. 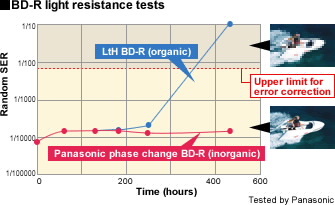 LTH refers to changing the organic dye from low reflectivity to high reflectivity. Unfortunately, since this was introduced after Blu-ray entered the market, the compatibility of these types of discs are lower, requiring hardware manufacturers to create special firmware to recognize such discs. The manufacturing process to create LTH discs is the same as older CD’s, and DVD’s manufactured on converted CD-R and DVD-R production lines, using organic dye and a spin-coating process. Initially, this brought a lower cost disc to market. However, over time problems using organic dye-pigment for long term data storage became apparent. The organic dye has a high sensitivity to light, and lower compatibility in the market, resulting in shorter lifespan of your data on the disc, and possible issues burning or reading the data on these discs. Prices of recordable Blu-ray discs have continued to drop over time. The price difference in high quality inorganic HTL and lower cost LTH media is far less than it used to be. Some manufacturers can even offer high quality HTL discs at a lower cost than most LTH media in the market [ahem… see DIGISTOR media for such high quality, low cost discs]. Data integrity is of utmost importance when storing 25GB, 50GB, 100GB or more of data. BD-R quality does matter, and when choosing a Blu-ray disc for your projects, use a high quality inorganic HTL disc for long life, data retrieval, and piece of mind.